I’ve promised this one for a while – and I finished this book a while back but I really wanted it to sink in before I wrote this blog. That’s how much I love this book and the trilogy as a whole. Bravo, Margaret Atwood, bravo. I’m actually sad that it’s over. I could happily read more of this world and its characters – who knows, maybe it’ll happen? – but I doubt I’ll get the chance. There is a definite ending here, which is a whole different conversation (one I’ll discuss in the future, I’ve just decided). It’s been an interesting journey starting with Oryx and Crake, continuing with The Year of the Flood and now ending with Maddaddam. The latter is why you’re here, of course, so let’s get on with it. Feel free to catch up with my thoughts on Oryx and Crake and The Year of the Flood, first. Also, there will be spoilers, later. Another warning will help you divert attention if you haven’t finished it yet. Unlike with The Year of the Flood, which takes place at roughly the same time as Oryx and Crake, Maddaddam picks up more or less right after. You could almost argue that it’s not a sequel to The Year of the Flood alone but Oryx and Crake as well. Toby continues to serve as our narrator and protagonist now, although Jimmy isn’t out of it totally, but his use is limited. You’ll remember this from the previous books and discover how he fares as you read on. Also, as with most first person stories, there’s a fair amount of bias in Maddaddam. In The Year of the Flood, Toby was fairly even and neutral but that’s changed now there are other people around and Zeb returns. She does get a bit whiny at times but I can’t say I’m not sympathetic to her. You’ll have to let me know if you agree. Other than that, this book is written as skilfully as the others. There isn’t a moment in any three of them that I didn’t enjoy. Once you get past the fragmentation and accustomed to the characters, it flows fantastically. You won’t even remember how clunky and confusing it was at the beginning after a while. Yeah, you heard me. Both books before this were fragmented with events that happened before and events happening then. It was easily to become lost and confused with Jimmy’s and Toby’s thoughts, memories and current events. 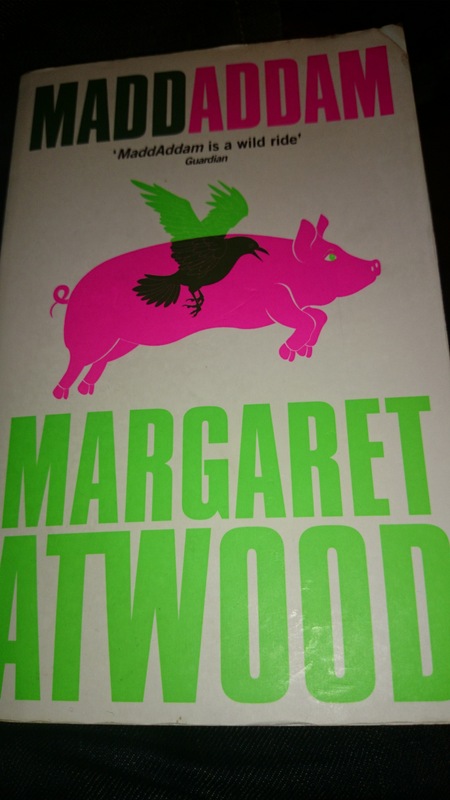 Maddaddam goes a bit further. Here, we learn the story of Zeb throughout the book. That might not sound much different or more complicated than the others but there’s more. This story runs alongside the main one, so we’re used to that by now but following each section of Zeb’s story is a retelling of that part to the Crakers. This is a big clue to Toby’s frame of mind and character – a bigger clue than any other. Don’t glaze over these parts too because it all adds up to something in the end, which is important to all three books. The search for Adam One is a big part of this book and if you don’t know already, you’ll learn for definite who he actually is along the way. Is he dead or alive, though? I won’t tell you that. While survival is still important, we are given more information about the daily life of the survivors and the things they have to deal with. This is always exciting, it’s Zeb’s story which provides more of that – along with plenty of laughs. Maddaddam will reunite old friends, kindle hope and also break your hearts. Be prepared for some emotional goodbyes because after all the work the survivors put in, this isn’t a perfect happily ever after. It’s a satisfying conclusion all around and it shows that just because the story ends, the world does not. That’s one of the things I like most about stories – they live on in our imaginations long after the words have ended. When there are questions to be answered, we’re even more intrigued. I will return to this topic later, it’s an interesting one. For now, however, go read this book – and the others too!